Popocatépetl (Central Mexico): Activity has been elevated. During 15-16 June, CENAPRED recorded 3-4 emissions per hous, including a few stronger explosions. One yesterday morning threw incandescent fragments on the north side at a distance no greater than 500 m.
Santa María / Santiaguito (Guatemala): Activity has remained more or less stable. Occasional explosions occur from the lava dome producing small ash plumes of a few 100 m height. The viscous lava flows on the flanks of the dome are mostly stagnant, but sometime experience small advance and collapses, mostly the flow on the southern side (left in the picture). 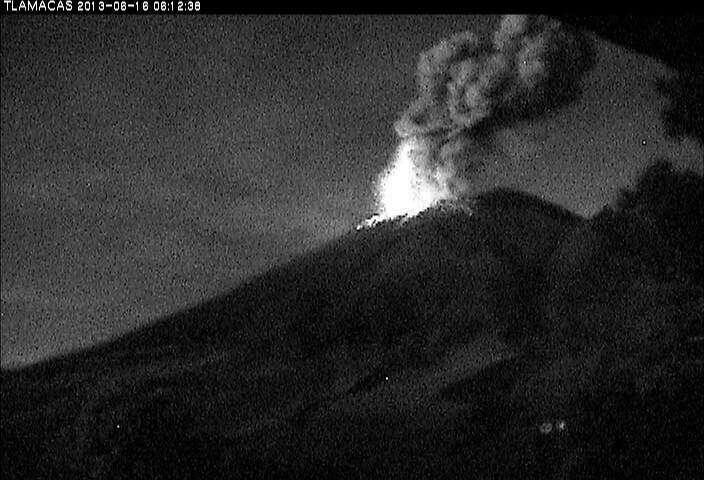 Pacaya (Guatemala): Eruptive activity has resumed. Weak incandescence and explosions could be seen and heard during the past days. Today, no direct observations were reported, but volcanic tremor increased significantly during today, which could indicate some more vigorous activity soon. Fuego (Guatemala): Activity has increased during the past days. A new small lava flow started on 14 June on the southern flank and had a length of 300 m this morning. Explosive strombolian activity has picked up a bit as well. Glowing tephra is ejected to 75-125 m height, and ash plumes rise to 3-500 m above the crater.